Faith, hope and charity are now major themes in the new series and Russell T. Davies puts further emphasis on them in his latest, and for the moment, best script for the series. Has Russell suddenly got that old time religion? 'The Old Rugged Cross' and 'Abide With Me' heard in the same episode! No, he's not changed his mind but is merely showing how faith works as a concept without recourse to singling out any particular deity or belief system in which to place your trust. The only trust and faith you need is the one Martha clearly shows us, the faith in the Doctor, and a notion that even under the greatest pressures all creeds and colours can have trust and faith in each other as thinking, breathing beings. Davies' use of hymns is not just a symbolic representation of this but it's also a clever critique of how organised religion often provides an opiate for the masses, a pacifying salve for an unquestioning society. 'Gridlock' comes over as 'The Pilgrim's Progress' gene-spliced with the venerable '2000AD' comic. It's a giddy vortex of comic strip images, very cinematic in their scope, and a claustrophobic dystopian tone poem with nods to 'The Fifth Element' and 'Blade Runner' as well as the classic series 'The Macra Terror'. It also reinforces Davies' obsession with vertical narrative. We travel from the Macra (devils in Hell?) infested depths, through layers of trapped cars (souls) and ultimately into 'heaven' when the sky splits open. The episode is very Dante-esque in approach, with everyone trapped in a bizarre, smog filled Purgatory and requiring either the Doctor or the Face Of Boe to lead them through the various circles of Hell, including the Over City, into a climactic light-filled redemption. How 'religious' is this episode!? I don't think it's making any comments about any particular religion as such, just using archetypes and imagery to illustrate various points about the redeeming power of trust and faith. In fact, the book-ending of the story with those quiet moments about Gallifrey are perhaps indicative of Davies' attempt to say that even though the old time religion of the Time Lords, once itself a choked gridlock of elitist attitudes, has gone it's the Doctor's clear love for his home world that ensures that something remains of the balancing force of that supposedly dead race. It may be full of bonkers ideas, but Doctor Who has never been about getting the science and the realism 'right'. World building in the series should never be to the detriment of the drama and it would be churlish to criticise the vagaries of the concepts here. It is simply the idea of different kinds of beings living in this way that we need to refer to rather than the exact domestic arrangements or the technobabble that allows them to fly their cars. It's all part and parcel of the visual metaphors that the story uses. I loved the way the story switched from one couple to another, giving us different views into each of their private little worlds. Certainly seeing the naturists, the bizarre black cat and its accompanying virgin brides, the city gent et al are both hilarious and surreal moments in a dark, sinister story where drugs wipe out an entire city population and the survivors have to run the gauntlet of giant crabs. The inclusion of the Macra was a lovely nod to the past and they were simply there as another flavour to the story and to have expected the story to focus on them would have been naive. This is a Russell T script, after all. The death of Boe, like the death of King Arthur, is a significant step towards a greater narrative we have yet to see play out. The literal death of the 'god-head' here does signify that Davies is more interested in the collective power of people rather than their subservience to a God. The flip side of that is that of course without Boe none of those trapped in the circles of Hell would have survived. Another instance of self-sacrifice for the greater good in the series that seems to follow in the wake of God-like figures and I'm sure we'll see more of this as the series plays out this year. Beyond the deeper questions that the script throws at us is the outstanding performance from David Tennant. He lies to Martha about Gallifrey and by the episode's conclusion understands that he can't get away with it and must be open to her about his status as the last of his race. He and Boe are both ancient, lonely creatures and both realise that they must be true to their nature without jeopardising the lives of others. Tennant's final scene with Martha in the alleyway should be seen as the single example of why this actor is right for the role. It brims with sadness, lost hope and is played as a confessional between them both. And he finally lets Martha in. Agyeman continues to excel, with Martha's exuberant obstinacy, honesty, and no nonsense intelligence shining through here and allowing her to put a singular stamp on the role. 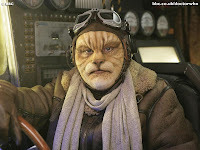 Ardal O'Hanlon as Brannigan and Anna Hope as Novice Hame were great supporting characters and praise should go to the stunning make ups by Neill Gorton. Finally, The Mill should also be congratulated for their work on the episode, turning the gridlock, the city and the Macra into spectacular images that continue to make this series such a thrilling experience. You really did get a sense that all departments were pushing to make this an episode to remember. Overall, it's a fitting conclusion to the New Earth trilogy started in 'End Of The World' containing some very interesting views about organised religion, the class system and population control. A bold script from Davies for a third series that doesn't even want to rest a little on its laurels.